I sat down with Tim Kohler, the creator of the Village Ecodynamics Project agent-based model, professor of anthropology at Washington State University, researcher at Crow Canyon Archaeological Center, and external faculty at the Santa Fe Institute, to discuss his philosophy on complexity science and archaeology, and get some tips for going forward studying complex systems. I took a sabbatical in the mid-1990s and was fortunate to be able to do it at the Santa Fe Institute. Being there right when Chris Langton was developing Swarm, and just looking over his shoulder while he was developing it, was highly influential; Swarm was the original language that we programmed the Village Ecodynamics Project in. Having the opportunity to interact with scientists of many different types at the Santa Fe Institute (founded in 1984) was a wonderful opportunity. This was not an opportunity available to many archaeologists, so one of the burdens I bear, which is honestly a joyful burden, is that having had that opportunity I need to promulgate that to others who weren’t so lucky. This really was my motive for writing Complex Systems and Archaeology in “Archaeological Theory Today” (second edition). What complexity tools do you use and how? I primarily use agent-based modeling, although in Complex Systems and Archaeology I recognize the values of the many other tools available. But I’d point out that I do an awful lot of work that is traditional archaeology too. I recently submitted an article that attempts to look at household-level inequality from the Dolores Archaeological Project data, and this is traditional archaeological inquiry. I do these studies because I think that they contribute in an important way to understanding whether or not an exercise in a structure like the development of leadership model, gives us a sensible answer. This feeds in to traditional archaeology. In 2014 I published an article calculating levels of violence in the American Southwest. This is traditional archaeology, although it does use elements of complexity. I can’t think of other instances where archaeologists have tried to analyze trajectories of things through time in a phase-space like I did there. The other thing that I do that is kind of unusual in archaeology (not just complexity archaeology) is that I have spent a lot of time and effort trying to estimate how much production you can get off of landscapes. Those things have not really been an end in themselves, although they could be seen as such. However, I approached trying to estimate the potential production of landscapes so that it could feed into the agent-based models. Thus these exercises contribute to complex systems approaches. What do you think is the unique contribution that complexity science has for archaeology? I got interested in complexity approaches in early to mid 1990s; during that time when you look around the theoretical landscape there were two competing approaches on offer in archaeology: 1) Processualism (the new archaeology), and the reaction to processualism, 2) Post-processualism, which came from the post-modern critique. If you look at post-processulism, at its worst people like Tilley and Shanks in the early 1990s, you have this view of agency… People are acting almost without structures. There’s no predictability to their actions. No sense of optimality or adaptation that structure their actions. Although I would admit that these positions did have the effect of exposing some of the weaknesses in processual archaeology, they didn’t offer a positive program to make a path going forward to understand prehistory. I thought what was needed was a way to think about the archaeological record as being composed of the actions of agents, while giving the proper role to these sorts of structures that these agents had to operate within (people within societies). I also thought that a proper role needed to be given to concepts like evolution and adaptation that were out the window for the early post-processualists. That is what complexity in archaeology tries to achieve. A complex-adaptive system approach honors actions of individuals but also honors that agents have clear goals that provide predictability to their actions, and that these take place within structures, such as landscapes or ecosystems or cities, that structure these in relatively predictable ways. How does complexity help you understand your system of interest? Complexity approaches give us the possibility to examine how high-level outcomes emerge from the outcomes of agent-landscape interaction and agent-agent interaction. These approaches to a great measure satisfy the weaknesses of those the two main approaches from 90s (processualism and post-processualism). So we have both high level outcomes (processualism) and agent level actions (post-processualism) but complexity provides a bridge between these two. What are the barriers we need to break to make complexity science a main-stream part of archaeology? Obviously barriers need to be broken. Early on, although this is not the case as much any more, many students swallowed the post-processual bait hook, line and sinker, which made it so they wouldn’t be very friendly to complexity approaches. They were, in a sense, blinded by theoretical prejudices. This is much less true now, and becomes less true each year. The biggest barrier now to entry is the fact that very few faculty are proficient in the tools of complex adaptive systems in archaeology, such as agent based modeling, scaling studies, and faculty even are not proficient with posthoc analyses in tools like R that make sense of what’s going on in these complex systems. Until we get a cadre of faculty who are fluent in these approaches this will be a main barrier. Right now the students are leading the way in complex adaptive systems studies in archaeology. In a way, this is similar to how processual archaeology started—it was the students who led the way then too. Students are leading the way right now, and as they become faculty it will be enormously useful for the spread of those tools. So all of these students need to get jobs to be able to advance archaeology, and that is a barrier. Do you think that archaeology has something that can uniquely contribute to complexity science (and what is it)? I would make a strong division between complex adaptive systems (anything that includes biological and cultural agents) and complex nonadaptive systems (spin glasses, etc.) where there is no sense that there is some kind of learning or adaptation. Physical systems are structured by optimality but there is no learning or adaptation. The one thing that archaeologists have to offer that is unique is the really great time depth that we always are attempting to cope with in archaeology. What do you think are the major limitations of complexity theory? I don’t think complexity approaches, so far at least, have had much to say about the central construct for anthropology—culture. Agent-based models, for example, and social network analysis are much more attuned to behavior than to culture. They have not, so far, tried to use these tools to try to understand culture change as opposed to behavioral change. It’s an outstanding problem. And this has got to be addressed if the concept of culture remains central to anthropology (which, by definition, it will). Unless complexity can usefully address what culture is and how it changes, complexity will always be peripheral. Strides have been made in that direction, but the citadel hasn’t been taken. Does applying complexity theory to a real world system (like archaeology) help alleviate the limitations of complexity and make it more easily understandable? Many people who aren’t very interested in science are really interested in archaeology. So I think archaeology offers a unique possibility for science generally, and complexity specifically, by being applied to understanding something that people are intrinsically interested in, even if they aren’t interested in other applications of same tools to other problems. It’s non-threatening. You can be liberal or conservative and you can be equally interested in what happened to the Ancestral Puebloans; you might have predilection to one answer or another, but you are still generally interested. But these things are non-threatening in an interesting way. They provide a showcase for these powerful tools that might be more threatening if they were used in an immediate fashion. What do you recommend your graduate students start on when they start studying complexity? I learned an enormous amount by a close reading of Stu Kauffman’s “Origins of Order.” I read this during my first sabbatical at SFI, and if you were to look at the copy you’d see all sorts of marginal annotations in that. We don’t see him cited much nowadays, but he did make important contributions to understanding complex systems. In terms of technology or classes, the most important things would be for them to get analytical and modeling tools as soon as they could and as early as they can. In the case of Washington State University, taking agent-based modeling course and taking the R and Big Data course would be essential. But to be a good archaeologist you need a good grounding in method and theory, so taking courses that fulfill that as early on as possible is essential. What are two current papers/books/talks that influence your recent work? I’m always very influenced by the work of my students. One of my favorites is the 2014 Bocinsky and Kohler article in Nature Communications. Another is upcoming foodwebs work from one of my other students. These papers are illustrative of the powers of complexity approaches. Bocinsky’s article is not in and of itself a contribution to complex adaptive systems in archaeology, except that it is in the spirit of starting off from a disaggregated entity (cells on a landscape) and ending up with a production sequence emerging from that for the system as a whole. It shows how we can get high-level trends that can be summarized by amounts within the maize niche. So it deals, in a funny way, with the processes of emergence. It’s a prerequisite for doing the agent-based modeling work. 2014 (first author, with Scott G. Ortman, Katie E. Grundtisch, Carly M. Fitzpatrick, and Sarah M. Cole) The Better Angels of Their Nature: Declining Violence Through Time among Prehispanic Farmers of the Pueblo Southwest. American Antiquity 79(3): 444–464. 2014 (first author, with Kelsey M. Reese) A Long and Spatially Variable Neolithic Demographic Transition in the North American Southwest. PNAS (early edition). 2013 How the Pueblos got their Sprachbund. Journal of Archaeological Method and Theory 20:212-234. 2012 (first author, with Denton Cockburn, Paul L. Hooper, R. Kyle Bocinsky, and Ziad Kobti) The Coevolution of Group Size and Leadership: An Agent-Based Public Goods Model for Prehispanic Pueblo Societies. Advances in Complex Systems 15(1&2):1150007. Plus there is a good selection of social science focused sessions which should be of interest to archaeologists. Follow this link for more details. The abstract deadline is TODAY so get it in there asap. In the old science things were simpler. As a scientist you would look at a problem, dissect it into components and then research them one by one. The general belief held that the more you know about the components the better you understand the system and hence the closest you are to solving the problem. And so we run in a similar vein for a few hundred years and we were doing just fine. Until a few decades ago, when more and more voices started uttering uncomfortable questions and pointing out to some perplexing results of their research. Normally, you could dismiss pretty much any piece of research which gives counterintuitive results but this time the fussers were using two things that are really difficult to dispute: maths and computers. And so, as Thomas Kuhn would call it, a paradigm shift started to happening. The definition of complexity is multidimensional and often varies adjusting itself to the interests and assumptions of a given scientific field. There are, however, a few core elements that seem to characterise complex systems regardless if they’re made out of particles, neurone, mice or men. You can start with what it says on the tin: complexity science deals with complex systems. And a complex system is a system consisting of a large number of independent components which interact with each other and sometimes also with the environment, a good example of which is a society, an ant hill or a brain. So far, this is in line with what we called the ‘old science’ view of the world but there is a key difference. In the complexity science view the interactions between the system’s elements, even if following very simple rules, can lead to large-scale complex patterns which would be difficult to predict just by looking at the individual components. A great example of which is a flock of birds – it is a magnificent show involving hundreds of birds creating one multi-element “organism” able to effectively escape predators, travel thousands of miles but also, on a cheerful note, turn the Italian capital into a smelly pile of bird’s poo. It may come as a surprise, but bird flocks are leaderless and it was shown that the individual birds need to follow only three rules to form a flock: 1. align with nearby birds; 2. adhere to the nearby birds; 3. but try to avoid collisions (don’t believe? check out the simulation for yourself: NetLogo Flocking). Other commonly quoted examples of complex systems include: human brain, global economy, cities, ecosystems etc. They often have a great ability to adapt rapidly to the constantly changing circumstances but they’re also prone to very dramatic changes if a specific threshold is crossed (think economic crashes). All this happens without a centralised control, a leader and often without any influence of exogenous factors (you may be mortified to learn that trafic jams can occur with no reasons whatsoever). 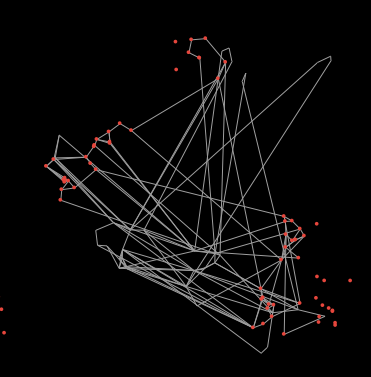 The main two tools of complexity science are simulations and network analysis. A number of successful applications of both of those techniques to archaeological case studies showed the great potential of this framework. This includes a great case study of growing the artificial society of the Anasazi, getting to better understand early hominid’s behaviour and food sharing or the numerous simulations of the Neolithic wave of advance. However, at the moment complexity science in archaeology is undergoing its adolescence growth spurt with the number of new applications growing exponentially. Being still in its formative phase it is vulnerable to uncritical applications and it’s lacking a solid theoretical framework although its potential is being more and more widely recognized. Complexity science offers an exciting opportunity to bring archaeology closer to more quantitative approaches as the tools it uses enforce binary description of the system. It is also a fantastic playground for testing out new (and old) models. Luke Premo called the simulation environment a ‘behavioural laboratories’ in which one can “eliminate plausible scenarios that are nevertheless unlikely to have occurred” ( Premo 2006, 108). Finally, complexity science tools are the only way in which one can fully understand the nature of complex systems of which past human societies are definitely one.